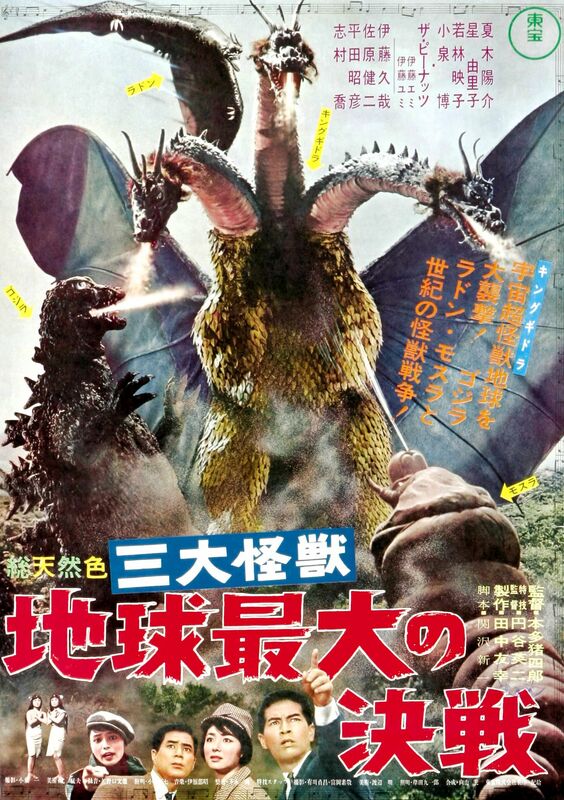 Cinema Sunday: Ghidorah, the Three-Headed Monster (1964) | Magazines and Monsters! Title: Ghidorah, the Three-Headed Monster Distributor: Classic Media/ Toho Writer: Shinichi Sekizawa Director: Ishiro Honda Producer: Tomoyuki Tanaka Starring: Yosuke Natsuki, Yuriko Hoshi, Hiroshi Koizumi, Akiko Wakabayashi Released: December 20th, 1964 MPAA: NR Growing up, I was a huge fan of the Toho Studios Godzilla movies. Say what you will, but to a young kid, they were nothing short of extraordinary, and had me believing that nuclear bombs could change a salamander into a giant ravenous beast capable of destroying entire cities. This fact kept me glued to the television for hours on end when the movies were on. I didn’t realize it was a dude in a rubber suit until later, but that fact didn’t diminish my love for the genre! So, now, let’s get to this classic from Toho Studios! The movie begins with a room full of scientists and reporters, as they’re watching the skies, looking for UFO’s. One reporter doesn’t believe any of this nonsense, but then the scientists chastise her about the subject. Suddenly, a meteor shower occurs, and the scene then shifts to the local police precinct. They discuss how a princess, Salina Salno, (Akiko Wakabayashi) from the Himalayas, is on her way and she needs protection against a threat to her life. As the airplane speeds towards Japan, some conspirators talk about how they’ve planted a bomb on the plane to take her out. She then gazes out the window, and a bright light shines in her eyes, and a voice commands her to stand up, and leave the plane. Just as she jumps off the plane, the bomb explodes, destroying the plane. Back in Japan, some scientists are checking out some of the fragments from the meteor shower. As the expedition proceeds down a deep gorge, they realize something strange is afoot, because their compass’s aren’t working. They continue on, and eventually come to the site where a giant meteorite has landed. It almost appears egg-like, and the astonished scientists decide to make camp. Over at the police station, the cops, Detective Shindo (Yosuke Natsuki), and Chief Detective Okita (Akihiko Hirata), discuss the plane bombing. Just as they’re wrapping things up, reporters begin to flock to a park, where a mysterious woman is making outrageous claims about Earth, and its future. The audience heckled her, and she reprimands them for it. The girl tells them that she’s from Mars, and that the Earth is in terrible danger. As a local TV show gives a glimpse into what Mothra is up to, and then the police see a newspaper picture of this woman from Mars, and it looks exactly like the princess from the Himalayas. The ruler of the Himalayas sends his goons to Japan to take her out if it is really her. The police then question Professor Miura (Hiroshi Koizumi) about the possibilities of the princess surviving the bombing. He tells them that it’s possible, but highly unlikely. A news story breaks in on the TV, where the girl claiming to be from Mars is at the site of the crater from the meteorite, and she tells them all that Rodan is underneath the site, and is ready to rise. Just as the people are mocking her, the ground begins to shake, and Rodan appears! Next, we see a ship out at sea, floating along quietly. 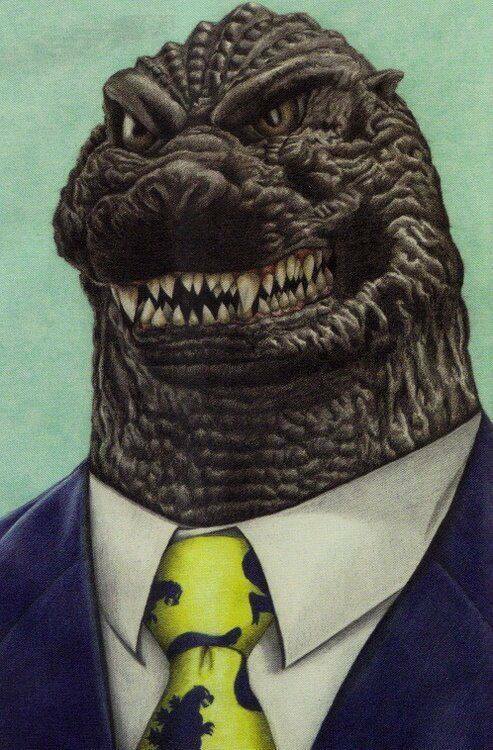 The quiet lasts about thirty seconds though, because Godzilla shows up, and uses his atomic breath to obliterate it. 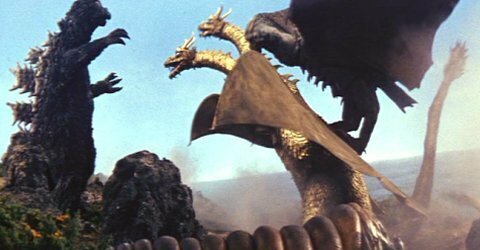 Over at the camp site, the scientists see that the meteorite is growing, and then finally, it explodes to show Ghidorah, the Three-Headed Monster! Back in the city, Godzilla and Rodan are tearing the city to pieces. Over at a doctor’s office, the girl claiming to be a martian is being examined. The doctor gives her a clean bill of health, but then she gives another warning. This time she tells them about Ghidorah, and his origin. She tells them that many years ago, Ghidorah came to Mars, and left nothing but devastation in his path. The government has a meeting to decide what to do. As they discuss options, the decision is made to have Mothra try to convince Godzilla and Rodan, to team up, and fight Ghidorah. Before the move can be made, Ghidorah attacks the city. Mothra is called, and begins to journey across the ocean to Japan. Meanwhile, Rodan and Godzilla are fighting each other on the other side of Japan. Mothra reaches them, and asks for help. Rodan and Godzilla wont listen though, and Ghidorah continues his destruction. The goons that were trying to kill the princess/martian finally get what’s coming to them, when a rock-slide smashes them into pulp. The scientists continue to watch as Mothra pleads with Rodan and Godzilla, but they couldn’t care less. Mothra (who’s not the original Mothra, but an offspring that’s still only a caterpillar) decides to try to take on Ghidorah by himself. After taking a beating, Mothra is ready to give up. Godzilla and Rodan then join the fight, to even the odds. One of the goons survived the rock-slide in the car though, and he shoots the princess, injuring her badly. Ghidorah and Godzilla are fighting nearby though, and an avalanche kills the goon. The three monsters, Godzilla, Rodan, and Mothra, give it one last try, and pounce on Ghidorah. The three manage to overtake the alien monster, and by combining their powers, they beat him- Mothra spins silk over Ghidorah’s head, and Godzilla picks him up, and slams him down on the ground. Realizing he’s outmatched, Ghidorah leaves the planet. OK, here we go: I don’t think anyone can argue the awesomeness of seeing these three monsters fighting the best evil monster, King Ghidorah. The visuals in this film are most certainly the aspect that carries it, and the fight scenes in particular. Some of the story was OK too, but it really doesn’t help carry the film or add much to the overall greatness. The cast all does an adequate job, and definitely deserve credit. The final fight scene was nothing short of great. Seeing Godzilla get tossed around was quit jarring to me as a child, because I thought he could never be beaten or handled like that in a fight. It was cool to see Rodan again, but I was a little disappointed with Mothra. I would have rather seen a fully matured Mothra, instead of the caterpillar version. Other than that, no complaints from me about the film. Listen, you’re either a fan of this genre or you aren’t, there’s no middle ground. If you want a deep plot with Academy Award winning acting, this isn’t for you. But, if you’re in the mood for some good old-fashioned action with guys in rubber suits smashing model cities, then get out and grab some Godzilla! Image below by artist Jim Strate and first appeared in G-FAN magazine! This has always been one of my favorite Godzilla movies, even if it is the one where he begins his transformation from rampaging engine of mass destruction to kid-friendly heroic protector of humanity. You may want to pick up the DVD which has both the original uncut, subtitled Japanese version of the film and the American release.